Oy, I’m already behind. Here’s a quick post about the second part of Day 3, April 12, of Prince William and Kate Middleton royal tour of India. 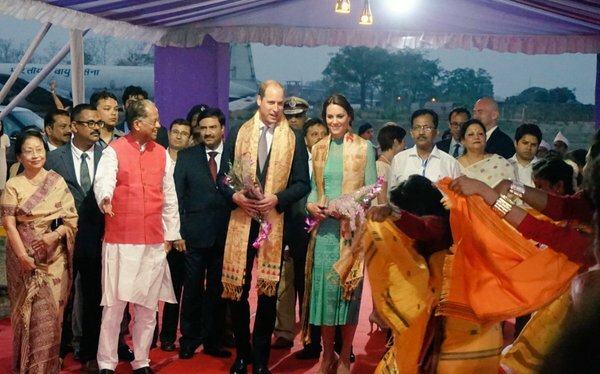 After their final engagements in New Delhi, the Duke and Duchess of Cambridge flew to the Indian state of Assam where they attended a campfire celebration of the Bohag Bihu festival. William and Kate were given a welcome when they arrived at Kaziranga National Park in Assam before changing and heading to the campfire celebration. Bohag Bihu (also called Rongali Bihu) is a festival celebrated to mark the Assamese New Year, the coming of Spring, and the end of harvest season. The Bihu lasts for seven days. The couple watched dance performances from a groups of dancers and drummers, including a little boy whom William and Kate took a liking to. Kate wore an American designer she’s never worn before: Anna Sui. She chose a dress from the AW15 collection, the “Printed crinkled silk-chiffon and twill maxi dress” (£805). Kate wore another pair of wedges, her Pied-a-Terre Imperias in black that she’s had for several years. Kate, again, dug out a pair of earrings from her girlfriend days. These gold and green stone earrings date from at least 2006. I like these; they’re cute. Here are part of Kate’s entourage getting off the plane in Assam. On the left is Rebecca Deacon’s assistant, Sophie Agnew, and on the right is Kate’s PA/stylist, Natasha Archer. Amanda Cook Tucker – Kate’s hairdresser. 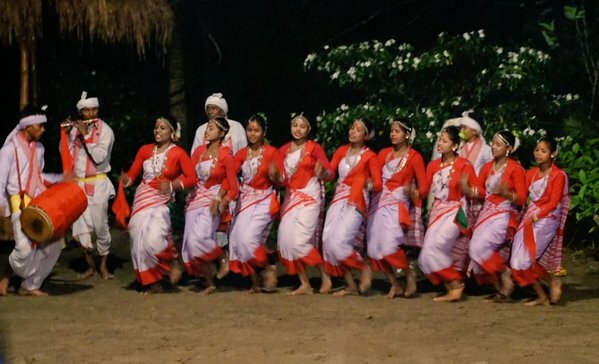 Here are two videos of the Bihu celebration. Thank you so much, KMR! You put so much time and effort in this blog! This event was nice, that’s for sure. Both of them looked happy and relaxed. After the meeting with the prime minister where William and Kate addressed the TATA Steel issue (*cough* Imagine a woman who is hardly able to pronounce the word “chutney” properly addressing economical issues *cough*) they were in dire need of a break….. The dress…not bad…it’s just not for her! The posture, the hair all over the place, the shoes! The shades of the dress are too dark, she is hardly visible during that evening event. In short: Royal Cousin Itt goes stiff hippy. Greta, I love your posts. You are always on spot and eloquent with a good dose of humour. Where did you learn your perfect English ? By the way, Queen Maxima is in Munich today. Do you have a chance for a glimpse ? Munich is well prepared for Maxima. But unfortunately I won’t have a chance to join the crowds because I’m at work… It would be so great to see Willem Alexander and Maxima in person. But, well…. Maybe next time. OH MY GOD!!!! I saw her!!!! During lunch break my co-worker and I decided to enjoy the sunshine in a park nearby. And that very same moment the Dutch royal couple arrived!!!!!! :-):-):-) Wow! The dress was beautiful and her voice sounds so tender and charming. And she said “I am so glad that you are here. Thank you so much.” (not to me, but I could hear her). And she said it in German without any trace of an accent! Oh Greta how wonderful – as you know we all love love love Max on this blog. She seems so warm and human, and is clearly hugely intelligent. After this personal experience with Royalty (from afar, for 10 seconds) I see why I have problem with Kate. It’s not (only) the bad fashion, the hair, the wedges of doom, the flashing….those are just symptoms of the way bigger issue: she refuses being a public figure. But being willing to be visible and to stand out is on top of the list in the job description. I’m a grown up woman in my 40ies. I have a family and a job, bills to pay, responsibilities, hobbies, friends, happy moments, sad moments. I managed to build myself a life I feel comfortable in. I don’t depend on any kind of “leaders”. But there are moments where it’s nice to look at someone who might serve as a good example. Those 10 seconds “with” Maxima saved my day. Not only because it was cool to see a celeb (hey, I live in Munich. You step out of the door and you meet celebs at every corner!). It’s because this couple oozes class, discipline, kindness, health, well-being in such a friendly and relaxed way! Those 10 seconds were full of positive vibes! Those vibes are even there when you only look at pictures of Maxima. When I look at pictures of Kate I feel different, like I should be the one to comfort her. She is not a leader, she’s a mere follower. That’s it. There are already too many followers on this Earth. Oh Greta, how wonderful you saw Maxima. As I said before, she is like her name. And you listened her speaking German, and withou accent. Great. After all the Kate stories it’s a relief to listen about othe female Royal. And I agree with what you said about Kate. Have a very nice day. I am so jealous! Your story only confirms Max as my favorite royal! Oh, Greta, how wonderful for you! And, you wrote so eloquently of what it meant to you to see Maxima! In today’s hectic world, where we are being pulled in so many directions, we could l all use a dose of her special presence! I’m so glad you decided to go out and how wonderful that you spotted her and got to hear her! Maxima has it all and knows how to present herself, inspire others and give back. She is a gem. Today will be a day for you to always remember and cherish. Thanks for sharing! OMG! How exciting! even more so since it was completely unplanned! I would love a glimpse of Maxima! Oh, Greta, good for you! I’m so happy you had the opportunity to see Maxima! She has it rings around Kate, doesn’t she? You wrote so beautifully about her and I am sure it was a wonderful day for you. One, you will always have as a cherished memory. Maxima is the real deal. She has charisma, but a loving and caring way about her, too. She is a good role model for all women and certainly represents her country well wherever she goes. She makes Kate’s visit to India seem rather child-like, yes? Yet, I need to add, Kate is doing better than I thought she would — minus the flashing, of course. Still, the bar is not set too high for her, is it? Thanks for sharing your news with us! SO EXCITING!!!!!! I adore Maxima. This is getting into areas I would sure enjoy…celebrations, campfire, safari, etc. It is all so colorful and musical. That 3 yr old little boy was so cute. I like this dress also I guess because I do like maxi dresses. It is different too. Thank you for your post. I imagine this is keeping you quite busy to keep up. I know It is hard keeping up reading everything and all the comments. But it has been fun and enjoyable. And what a learning experience about India. I also learned that Rebecca Deacon has an assistant. Thank you for the videos. Best part of the day – Longchamp bags everywhere. I love them! I’m a little (a lot…) obsessed with them too! I wish I had 100s. Best bags ever. You’re on the ball KMR, thanks!! Not a fan of the maxi, I don’t like the 2 clashing prints, I don’t know where to look, but at least the style of dress is appropriate this evening. She looks more engaged than her husband and seemed to really enjoy the dance. Thanks Cat. I agree with you about too much print happening on this dress. I am sure that my Grandmother had curtains like that in the 70’s. Not a fan of this outfit but that little boy is just adorable. I love it Greta! Thank you so much for sharing. I bet that you were over the moon to see Max today. It would have made my entire week. Ooooh I remember those. My auntie had them all over the place. 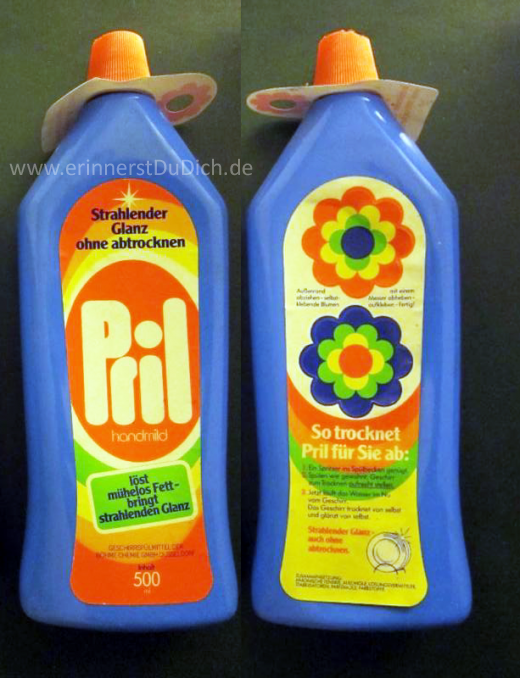 Nothing says 70s like Pril flowers. Give Munich a kiss from me, I miss it. Yes, it looks like Julie from Mod Squad decided to sew a pair of new curtains. Thanks so much for following this holitour, KMR! May I add my Thanks as well. We all will Tanya S – but KMR will need a holiday. I love your coverage. Thank you. I hope you know how much we appreciate you work. You are a wonderful writer. Thank you Tanya, Birdy, and Reilly. I think I will need a vacation after this. £800 for THAT – ouch, money wasted methinks. I much preferred the dress she wore in the morning, and feel she could have slipped that back on again. The shoes just don’t go with the oufit – why not wear the flats!!!! I’m holding my tongue on this mornings outfit, but can’t wait to vent….. Thanks KMR for keeping us all up to date. But I’m also feeling a bit like Mary Elizabeth and need a bit of something else next week. Well that’s ok, because Kate will no doubt go back into hiding. It was super muddy. Maybe that’s why she didn’t wear flats? I really dislike this dress. Boho chic has been exhausted. Way too much going on, too dark, and she looked like she was melting. Put your hair up woman. The cultural aspects are beautiful and the dancing boy is adorable. I thought Will looked better than she did. There is very little originality or thought in her outfits – like she did a Google search and picked them out all at once with little thought. Love the earrings, too! Not so much the dress. And, not with those wedges! uGH. The vibrant colors of the dancers’ costumes were so uplifting. And, that adorable child! Who wouldn’t love him. The Duke and Duchess seemed genuinely drawn to him and I thought that was nice. The media is always hammering home the point that W and K miss their own kids — a bit much. We all know that! Ms. Archer’s dress really was short and the pattern really emphasized her bust! I hate to be mean, but she really did not look professional. Do we expect more from Kate’s assistants, though. Her hairdresser looked nice. KMR, what a whirlwind trip for you and you are so on top of your game!. Many thanks for all you do to keep us informed and entertained. I always learn something from your blog. I think “$X for THAT – ouch, money wasted methinks” on a lot of what Kate wears. But yeah, this dress just isn’t for me. Next week a little tiara action is in order from the Danes. What is making me sad is the prices of the dresses Kate is wearing. They are very expensive. I know she must be well dressed but she is meeting poor people and the prices of the dresses are alarming.Thank God today is already Wednesday. I am counting the days for the week end. This is the most I saw Kate do in a week. I read a comment (KMR site? ), where someone said something along the lines of thinking they like something, and then realize they don’t really like it, but it is better than some of the really bad things Kate has worn. Seriously, is the “Kate effect” still in play? I look at it in terms of wanting to wear the item and if I think it is worth the price. I think it is getting to the point where Kate wearing a designer/or clothing company’s item does not have the impact it did 3-5 years ago. I appreciate all the work done by KMR, but IMO this is a dud of a tour. Perhaps, it will get better. There never was a Kate Effect. There was only Kate wearing seasons old clothing and then the press trying to claim it sold out when it was no longer for sale at all or pieces that had been on sale for months and stock was quite low and was going to be sold out very soon. Then the press would try to make it seem as though Kate were the reason it sold out when she wasn’t. I agree, Jamel. And these dresses aren’t even her style, so she’ll probably never wear them again. She could auction these clothes and donate the money to charity, but I guess it’s expecting too much from her. Yeah. None of these print dresses are Kate’s style and I would be very surprised if Kate ever wore any of them again. ouch for the wedges again 🙁 I can’ t see them! I completely agree Livia. The woman has no understanding of how to use fashion to blend in, stand out, or just look comfortable. It is getting boring. Looking at the pictures of her entourage, I think we may have solved one of life’s great questions – Where do Kate’s old shoes go to die? Answer: on the feet of her entourage. On a more serious note, is it just me or is this paying tribute to India getting out of control? Kate hardly ever wears prints at home and now every other outfit is supposedly a tribute to Indian culture. Most of them look like the stuff worn by the hippies that were in downtown DC when I was a kid. (but not at hippie prices) It almost seems like she is being rather condescending instead of truly paying tribute to the country. I don’t know how anyone of Indian descent feels about this idea. I have tried to put myself in their shoes – I think I would start to be a little insulted as it is starting to seem like she is making a joke of them instead – but I am not sure if I am just projecting. I don’t really have the right ethnic background to figure this one out – both sides of the family and I have nothing but English and Irish for several hundred years. Anyone else have an idea? Not only do I find her constant theme dressing patronising, her interpretation of India’s elegant and opulent fabrics and colours seems rather crass and garish. Is this what India looks like through her eyes? The print dresses are tiresome, and I can’t believe that I can’t wait till this week is over. My eyeballs need a rest. I think that Kate got the idea of dressing from head to toe in one colour from her hair dresser. Hi, Tanya: I liked the hairdresser. She was not trying to call attention to herself and she pulls the look off far better than Kate. She has poise. I loved the story of your Miss Four on the other thread. She sounds darling! Good luck with the open house. And, your purchasing a new one. And, yes, I agree that Kate has been rather patronizing to the people of India with her dress. Can’t wait to see her in Bhutan. She’ll go all out, I am sure, but won’t be able to pull it off very well. Is that mean? Hi, Tanya. I actually thought the hairdresser looked the best of the women in the entourage. Not calling attention to herself, but put together nicely. BTW, I loved your anecdote about Miss Four. She is adorable! What a little dynamo to have around! Wishing you luck with your open house. I thought the hair dresser looked nice and polished as well! Wow, I don’t know what is going on in this thread. I had posted comments early yesterday and when I checked later in the day, they were not there, so I reposted. Now, I look today and both of my posts are there, but the tile next to my name is sometimes green, not blue. What? At any rate, sorry for double posts and I wonder what is going on in cyber world. I think your email address was misspelled so your comments ended up in moderation and I didn’t catch them until several hours later and as soon as I saw them I approved them. And then even more hours later I realized that they were double posts. So that’s what happened there. I can delete them if you want. I agree MavenTheFirst. I am tired of her constant theme dressing patronising. I almost predict her next dress. She was predictable, and is now becoming predictable also in this tour. By the way, last week I had a nightmare I was fighting with you here on the blog. It was a relief when I woke up, LOL. Agree 100%. It makes me wonder what the crowds think of her clothing. I think her choices so far (considering the cost) have been dismal. I had that exact same thought! It’s like she thinks India means bright colors, or lots of colors, and picks dresses using that criteria alone. Completely ignoring criteria like how it looks on her, in photos, in crowds!! This particular dress doesn’t work on any level, I think. Too busy. I also don’t like the neckline on this one. Too matronly again, in my opinion. Regardless of what she wore, she continues to look terrible from her posture ALONE. That photo of her walking, with her head jutting forward, is horrible. Doesn’t ANYONE at court see this? Can’t anyone teach her how to hold herself? Queen Elizabeth wore variations of shades of green on at least six occasions during her state visit to Irelands from 17 May to 20 May 2011. That’s a lot lf green, but beautifully styled. I know she paid tribute to her hosts in her dress, a little too much, however, her words and actions resonated much more. She resonated dignity and respect. So theme dressing is part of the deal for royal visits I imagine, but words, actions and demeanour are much more significant. Incidentally, Diana paid tribute to hosts, but if I remember, just one outfit at a time. That’s the thing. You can and should pay tribute but every day and multiple outfits a day is overkill in my opinion. Diana knew how to work fashion. It generally worked for her. The Queen always dresses respectfully and with dignity. I just don’t see that here. KMR, I have to thank you too for your wonderful job with this tour and for working overtime. Don’t worry if you’re not always in time! We can hardly keep up ourselves and we’re only in the middle of this holiday/tour. My guess is that after this tour W&K will have to go on another holiday, private this time, so we’ll have plenty of time to detox and lay our sore eyes on something else or even dissect further Kate’s appearances in a subsequent round up. Don’t get me wrong, India is a wonderful country that I can only hope I will visit some day, however I am annoyed of the superficial approach of the royal couple while thinking that the people they meet are really above them. The wonderful lady who founded SMILE charity or the young Bollywood dancer from day one are examples of heroes of life, achievers against all odds that stand way above William & Kate. Even the ‘peasants’ who patienly squeeze to take a glimpse of them, are more worthy than pretentious aristocrats. If anything, this tour should humble them and not amuse them. However, don’t let my poor opinions diminish your work, KMR, which is always of the highest standard and from the right perspective. Love all these long dresses. She wears them well. But I think she needs to wear at least a few more outfits from Indian or Bhutanese designers! I don’t think she’s worn any since the first day. William looks the same as ever,but Catherine actually appears more genuinely interested on this tour.I wish she’d give a speech on foreign soil. Because here, she is a star. All the attention is on her, she is an adored celebrity. At home? Expectations and duty await. I have to join everybody here in thanking you, KMR. You are doing a great job here. It is only two or three (or four?) weeks or so, since I discovered your blog and I am a daily visitor ever since. You created a nice place you have to be proud of. Interestinging article that, IMO, confirms why the BRF ought to stay the hell away from India because their visits will always have an unfortunate whiff of colonialism against an exotic backdrop due to its history with the place. These visits won’t ever be eable to really address the negative heritage of colonialism because the BRF cannot be political and this issue is so very political. I’m presenting this opinion as an outsider, as someone who doesn’t have a dog in this particular fight and I hope I’m not offending anyone, and am sorry if I do. You are not offending at all! On the contrary, it is a sordid fact that the entire subcontinent has a weird love/hate relationship with Britain. It is something resembling that of an abused child of a narcissistic parent – we hate the colonisers but still look up to their way of life as a twisted role model. Nearly a hundred years on, the mentality is still there, and will possibly never completely erase since it has been so heavily recorded in history. So while a royal visit has its appeal with all its glamour and whatnot, its something that always leaves a bad taste in the mouth after it ends. I don’t think anything can change that. One of my neighbors is Indian. She said “This tour is just a holiday. Why don’t they focus on business relationships? ?” Well,… I’m German. I don’t know. Maybe this tour is the beginning of a new start. When Harry is king, everything is possible. The phrase in the last paragraph jumps out at me – ‘using this as a playground for their publicity stunt’ (or something similar) This is a jolly holiday for them, they are loving the attention, it took Kate months to plan her fairly unoriginal wardrobe, but they didn’t bother to do any research, or even snuggle up on the sofa and watch Bollywood movies. I loved Will’s comment yesterday – ‘what can we do?’ – as if he is actually going to help. I appreciate that their are some very deep wounds, but as two nations we have a lot to offer each other I think as trading partners going forward, and that is what this tour should be about – the future of two great nations. I doubt these two have even contemplated the historical aspect and relationship between Great Britain and India. That would require them to actually research, read, and actually think. They probably couldn’t even find India on a map if they had to. They’re just on holiday.Dense and completely self absorbed. In the first speech William did there was something about the BRF’s long and proud history with India – and I couldn’t help an inward cringe becaused that remark just testifies to such a lack of awareness. Their AU/NZ tour wasn’t as bad but there was a distinct and unfortunate whiff of colonialism on their first Southeast Asian tour. Just thinking about the pics of them being carried in chairs by “natives” is cringe-inducing. Plus, their tour doesn’t really seem geared towards a specific goal either. I don’t know what the common practice is with the tours of the BRF but when the DRF does foreign State Visits, they usually also travel with a delegation of business people and diplomats who use the stardust of the royal visit to pursue their own connections. which was ignored by the British govt.Of course the British built the railway transport system,improved the education system and banned horrific practices such as Sutti,but the overwhelming mood towards the British was negative esp. during the WWII period. But,how else would William have started?He isn’t bothered about crafting a speech that combines diplomacy with as much truth as possible.He’s not a game changer in the work department.Anyway,they don’t want the focus on the history,because then they’d have to confront disturbing facts.They want to get to know the India of the 21 century. Food for thought: Like in all former colonies the British, French, Belgians, Spanish ordered the building of infrastructure like roads, railways and ports to make it easy to extract the natural resources from the countries they ruled and sell them elsewhere. And not for the benefit of their “subjects” who manned these services but could hardly afford such extravagant means of transport in those days. I honestly don’t think that William writes his own speeches but whoever wrote this particular speech ought to have been a bit more sensitive. I think the history of colonialism should be acknowledged instead of completely ignored but neither should it dominate the subject of the speech. It is an extremely delicate business and it requires a very well researched and thought out approach and a deft hand with the language. They haven’t worked hard enough to carve out an identity. That’s why everything they do lacks substance. With Harry, he can always focus on veteran affairs or use his connections there to do something useful (like rebuilding the school with Team Rubicon). I don’t know why William doesn’t feel any shame. When he sees what Harry has done with the Invictus Games and Sentebale, does he not wish to create a legacy of his own? Charisma, fashion, attractiveness… these things are fun to pick apart, but what really matters is the work and they don’t do any. Agree with everyone who’s posted here… Just too much to agree with. I read his speech. Cringe worthy. The arrogance alone infuriates me. Oh I was waiting for this…. an article by a famous indian critic… she seems to have an opinion about everything, gets her into quite a bit of hot water at times! Now I understand the matronly hair dos. I’ve never seen a picture of Amanda before. It could be just me but I get this “I’m trying to be a cool grandma” vibe from her. But it’s failing horribly. I also didn’t know Rebecca had her own assistant. She needs to smile. And Tash gives this “I’m hotter than you cuz I’m friends with royalty” vibe in that pic. No wonder Kate isn’t doing well as a duchess. She’s got a horrible entourage. She needs some new, better educated/knowledged/trained/etc people working for her. Agree. Kate’s staff is dismal. The red dress with the short skirt? Very inappropriate. Also, makes the wearer look even bustier. Ugh. But, I forgot, this is the modern Royals and their modern staff! No decorum. No bothering to fact-check and proof-read their work. And, certainly, no need to do any preparations for such a trip. KMR, you are covering this jaunt with such style and effort. A big thank you for all the hard work you are doing now and always. These folks could learn from you! G, yes, they should! And, I still think Jason will quit! “I’m trying to be a cool grandma” vibe – YES! Why does Rebecca even need an assistant? Kate does next to nothing so I’d imagine she doesn’t spend that much time doing anything. I am partial to this type of dress. Having lived in Asia for a while, I think this boho style is perfect for an event like this. It’s light and airy for the hot weather. The patterns are not my favorite and the same shoes over and over have to go. But the earrings are great. She seems very engaged. I’ve read some of the comments regarding the colonialism and I could not agree more. I commented a few days ago when they visited the slums(myself having worked in slums in this part of the world). I was so frustrated to see how detached they were. The biggest problem I have is that there is still is a sense of paternalism coming off of these two. Reaching down and saying what can I do is not as good as getting on the same level as someone. William and Kate give off the “us” and “them” vibe which only perpetuates the systemic system of white superiority and paternalism. I think yesterday, seeing Kate on the ground with the children was exactly what needs to happen. Having done a lot of charity and mission work as a white westerner, I had to learn that even the littlest things can come off as me being superior. I do not think the Royals understand this, they live in an ivory tower. I saw these things not to rip them apart, but because they truly do not understand. But they need to learn because their history is so closely intertwined with it. That being said, UK is not the only country at fault for contributing to colonialism and failing to understand that there is still a system that “daughter countries” will take generations to come out of. This is a problem most Westerns are blind to and I hope will someday understand. Please do not be offended by anything I said! I think you nailed it there. It’s the ‘us’ and ‘them’ vibe which is the biggest turnoff, not only for these two but with many westerners when they travel to previously colonised countries. India being a case in point because its people actively rebelled against the colonial system, the vibe is stronger there. That is most likely why Diana seems to stand out so much. Her empathy in these situations was palpable. In comparison, poor coddled Kate has a long way to go. Though I have to admit, Diana’s empathy was more of an inbuilt talent, it really cannot be learnt along the way. But yes, sitting with the kids drawing did make Kate come a tad bit close! Rebekah, you’re totally right. There is the stereotype of the paternalistic white western who supposedly knows better and donates/makes charities probably for the sake of saving his own soul than the locals. In the Cambridges’ case however, my opinion is that the question is not how to get down to the level of the Indians but the realisation that the Indians are superior than them. As I commented up thread, these two have to get humble and realise that the people they meet are mostly simple and poor, but also amazing achievers. The Cambridges smile but don’t engage, talk but not touch. They don’t get their hands dirty. It was nice watching Kate on the floor but weren’t the children a little too washed and proper for street children? Everything is staged and whitewashed for them! If anything, their presence there accentuates the huge gap between the rich and the poor. If I was William, I wouldn’t ask ‘what can we do to help’. In all honesty, I would think the Indians can help William more. At least Harry pulled his sleeves up and got dirty trying to rebuild a school. He didn’t ask before. And that was the least he could do to ‘help’. Elina, you summed it up so very well! That should say, Amen, sister! It’s difficult to like William and Kate at this stage (5 years and counting) when they do so little in the UK. The evidence supports their lack of work ethics, so their gallant efforts to look engaged and being “keen” about poverty and animals fall on deaf ears. As an American, I prefer Prince Harry. I didn’t like him before, but he has grown up and his gestures reminded me of Princess Diana. Diana had this magic and it is now channeling in Harry. I hope he finds a wife unlike Kate. We don’t need another one like her (unemployed commoner rich girl) or surely the Monarchy will be abolished in our lifetime. The world is changing and so are expectations regarding royalty (and how much the taxpayers should pay for them). One US media asked Victoria Murphy, “Why are they in India?” And to listen to Victoria use the word “keen” — well, that said it all. Sorry, but you can’t make an elephant pink by saying that it is pink. (Truly. It. Is. Pink. Truly.) Ah, no. This trip is nothing more than an exclusive 7 day tour of a country for 2 very wealthy people. I think it had to be planned this way because neither William or Kate have the intellectual capacity to deal with anything more. P.S. Enough with those long “indian” print dresses and those fakukta wedges. The truth in a nutshell! Can’t even get interested in what she’s wearing…it’s all been repetitive, boring, and unflattering /missing the mark/ verging on ugly. Same with the hair. Which leaves us with nothing except a lot of pictures of the Cambridges enjoying an awesome holiday. I’m over it. And if the last few days were a holiday, today has been the safari that most people would die for, and climbing to the Tigers Nest is also on many peoples bucket list. The Queen doesn’t do the tourist stuff, she does the real stuff. Compare this to Harry’s visit to Nepal . Did he do Everest Base Camp ? No. He visited isolated communities and really helped them, learned and plans already to go again. We are so proud to have the Ghurkas in the British Army. Will and Kate? Just stay home with the kids, and save the taxpayer millions. Yes more and more I look royals specially W and K, more and more I say that I am happy that there is no more monarchy in France. For me, this tour is an opportunity to Kate to buy a maximum of new dresses and shoes, to compil a number of engagements. I criticized her lazyness but finally I’m happy to not see or hear from her or William; because more I learn about them, more I wonder how catastrophic his reign or his action of PoW will be. Like you said this tour looks like an holiday, I think that they really don’t realize how lucky they have to not worry about money, to have an influence in order to change the world, to travel and to learn from other cultures. But when I see their lack of preparation, their concerned face with vague speech (we want to hel, the taboo of mental health…) then see the reality of their action, I sigh : they have their position without merit (privilege of birth and marriage… even if a marriage with William doesn’t seem a privilege), I would like to believe that after the birthday of the Queen they change but I have no hope, they will find new excuses. When I see her in India, I see another person : disappear the anxiety : whether she is a good actress to fake discomfort in UK or to fake joy, whether the presence of William reassures her very much. But at the end, on this tour, we have picture of her but we have not heared her (apart little citation about her children, about Diana, about her weight…). I think it is too bad that they can not separate themselves during this tour and make differents engagements, that she can not make a speech. Damn it she is a mother, she is 34 years old!! +1 to all of comments Clem , brilliantly written. I forget to say that I believe that the first solo tour of K will not be very soon. – Do you recall the events in India from Camilla and Charles? – Do you recall the diplomatic incident/gaffes from W and K, from Harry during tours? Thanks Birdy, it is not easy to write my thoughts in English : Sometimes I am the impression that I am too critic or too abrupt… It is not a lack of politeness if it is the case. Thanks KMR and all the persons who comment : it feels very good to express opinion in peace, to laugh with some comments….. 🙂 I hope that this site will live more and more years. Next stop…….tour of a chutney manufacturing plant! Ha ha, who’s next for the chutney trail tour? Lol, BostonBrahmin. And what about a shopping spree in the bazaars for textiles? All William’s and Kate’s clothes on foreign tours are paid for by the British Embassy in the particular country they are visiting. In effect, the Foreign Office which means the taxpayer. It is a good excuse to buy a lot of designer wear at our expense. On another note, where is the glamour. I was never keen on Diana but at least she had glamour. KMR, if you want to delete this I totally understand 🙂 Anyhow, here are some great photos of CP Mary, P Sofia and Queen Max. I just can’t pick my favorite, Mary’s coat or Max’s dress. Definitely the first thing I noticed Birdy!! You are welcome Elina! I thought we could use a breath of fresh, royal air. Wow, look how genuine and happy the King and Queen Max are. What a difference from the Cambridges. Like Kate said about smiling, she’s just reciprocating. I believe it, she’s not initiating smiles. What a cold fish. Ooooh, Mary’s coat!! LOVE. I want it for my very own. Hi Ray, you’ll have to fight me for it :)! I will break the tie and take it for myself along with the lovely gloves! I don’t think so 🙂 You can have the gloves though. Shared custody?? I know we can work this out. You take M/W, I’ll have it T/Th and we’ll alternate weekends! Now, whose closet shall we divvy up next? I suspect we could spend much time Mary’s. her clothes are beautiful! Hum . I will talert Maxs diamond necklace and you can have her dress! that’s not very fair is it? Alright.. y’all have me convinced now. Max has totally jumped to the top of my list of fave royal ladies. Can you believe it, Sofia is about to give birth any day and she’s still attending meetings?? Gosh, I love the Swedes! Sofia’s been in the royal family for like 2 minutes and she’s already doing so much better than Kate. Now that’s what marrying into the royal family should look like. She’s not the only one either. Leti, Daniel, Max… if my knowledge serves me right, they were all commoners who married into royalty. They are doing a fabulous job. What’s Kate’s excuse? Just sad and pathetic! I’ve struggled to find anything to say today simply because I find this incessant theme dressing rather childish and there has been too much similarity in her wardrobe. I get that…..I have safe choices and silhouettes that always work, all women do but this ‘boho try to dress all ethnic because we’re in India’ is bugging me. A nod to your host on arrival or at a formal ‘state’ occasion is all that’s needed. This overkill shows how out of her depth Kate and her team are. Also I’m not seeing any gritty work here on this tour. I don’t like this new way of being Royal…..it smacks of having all the perks of a foreign tour without putting any graft in. It’s a Royal Tour ‘lite’ IMO which again sums these two up completely. For me it’s because at this point she’s caricaturing someone else’s cultural dress and it’s bordering on cultural appropriation. The designs I’m sure weren’t meant to be stealing anything from India but the way Kate’s wearing them puts them into that territory because she is basically using these outfits to replicate Indian dress. We all know it’s not because she loves the prints because she’s not one to wear any of these outfits back in the UK. The only person coming close to BRF that I could see actually loving these clothes as a part of personal style, or at least the prints, is Cressida. Also, I don’t understand why the hell she didn’t just wear modern designs made by actual Indian designers if she was going to do all that she’s doing. I think that’s paying the culture much more homage and respect. As long as there are no flashing incidents any dress that she wears is fine with me. The only negative point is the exhorbitant price tag of each dress ( except the £50 one) Maybe she could auction off these dresses when she goes home & the proceeds go to charity? Then nobody can complain that she’s wasting the taxpayers money. But will be many people ready to purchase this dresses?